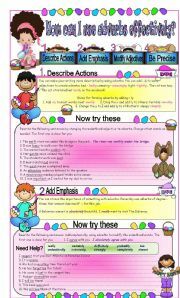 This ws is suitable as a reinforcement exercise, or as an introduction to the topic. A detailed explanation is given with two charts explaining the concept. 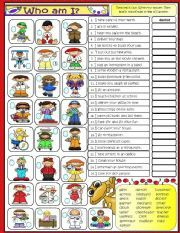 There are 2 pages of activities with 4 different tasks that are geared to give sts a deeper understanding of the topic. 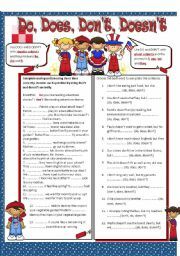 Ss practice using do, don´t, does, doesn´t correctly. Sts. will read clues to decide which job is described. Label picture clues with the correct job. An example is shown. Happy downloading, I hope you find this helpful. Much love! 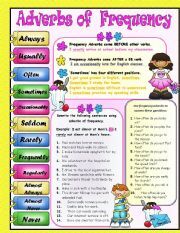 This ws can be used to improve sts vocabulary and to develop critical thinking skills. Using the info given sts, must decide what is being purchased. Picture prompt. 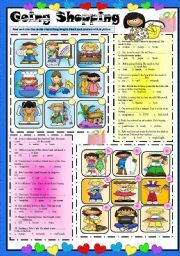 Editable w answer key. Happy new week. 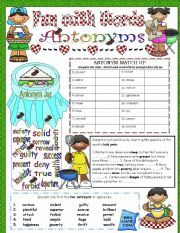 A fun worksheet that reinforces adjectives. Completely editable with B/W version. STUDENTS COMPLETE SENTENCES USING SO AND SUCH CORRECTLY. 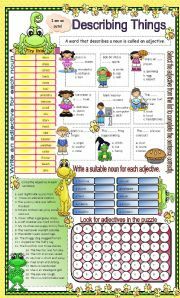 Worksheet is editable with answer key and includes a writing activity. Happy new week. Much love. Key words and terms in Computer Technology defined and illustrated. Hope this can be of help! Much Love!!! 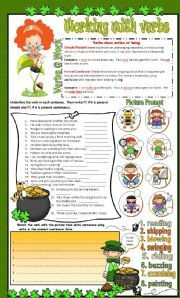 Students are able to identify input and output devices with this ppt.presentation. Much Love!!! What´s inside a computer? Students can find out with this powerpoint presentation.